The minimum pass marks for each course shall be 40% for undergraduate, postgraduate programmes and 50% for Ph.D. separately in theory & practical (if applicable). 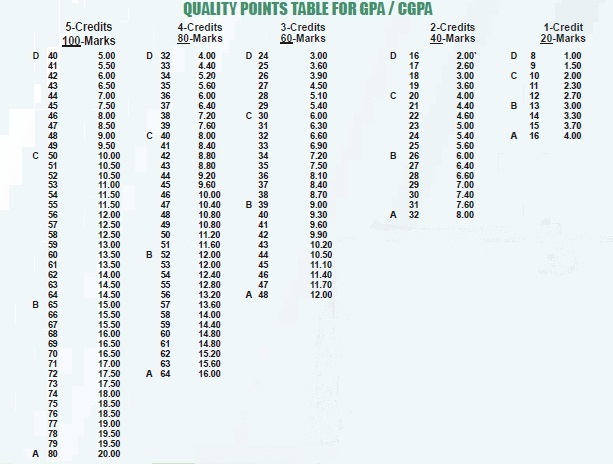 The grade point will be worked on the basis of percentage of marks obtained by a student in each course separately according to conversion table (Quality Points Table for GPA/CGPA) and not on the percentage of total marks obtained by a student. One credit hour shall carry twenty marks. The marks / grade required to pass a deficiency course shall be the same as in the regulations relating to the examination/course concerned. In theory paper, student’s evaluation shall be done by mid-term examination, assignment / quizzes / term paper & final examination. 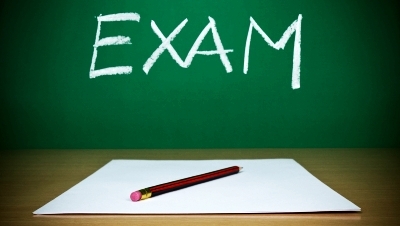 Both the mid-term & final examinations shall be compulsory; a student who misses the mid term examination, he shall not be allowed a make-up examination & shall be awarded zero marks in that examination, however, he may appear in the final examination. In case a student does not appear in the final examination of a course, he shall be deemed to have failed in that course. B. Sc (Hons.) Agriculture/DVM / B. Ed / M. Sc (Hons.) Agriculture/M.Sc (Hons.) Poultry Science/M. Sc/M.Phil/M. Ed/ Ph. D Agriculture & Biological Sciences, Economics, Forestry & Range Management, Wildlife Management and Environmental Sciences. Programmes of Study in UIMS, UIIT & BIIT. For practical examination (if applicable) 100% weightage will be towards final examination. A mid-term examination for minimum of one-hour duration will be held during 8-10th weeks of the semester. The results of the examination shall be submitted to the Controller of Examinations by the 12th week. However, Chairman/Incharge of the concerned department will be responsible for timely submission of Mid and Final Examination results. Quizzes, special home assignments &/or term papers shall be given from time to time which shall be uniformly split over the whole semester. has been on the roll of the University during that semester. has registered himself / herself for the courses of studies. has attended not less than 75% of the classes in theory and practical/laboratory of each course separately. Provided that the period of absence in the case of participation in co-curricular / sports activities with the permission of the competent Authority concerned may not be counted. All answer-books received from the Examiners after marking, shall be checked and tabulated in the office of the Controller of Examinations. The result of a particular examination will be notified by the Controller of Examinations. After receiving the answer books, if a discrepancy of numerical nature in the marking of the scripts comes to the notice of the Controller of Examinations, he shall take action to get it rectified. In case the result of a particular candidate or candidates be wrongly declared, and mistake is of serious nature the Vice-Chancellor shall issue orders that the mistake be rectified in a manner which appears to him to be just and proper. The Vice-Chancellor may order with-holding the result of a particular candidate or candidates, if it is considered necessary in the interest of the University to do so. Each successful candidate at a degree examination shall be conferred the degree free of cost at the subsequent Convocation held for the purpose. These degrees shall be signed by the Controller of Examinations, Vice-Chancellor and the Chancellor. The candidates who are not able to present/register themselves at the Convocation shall be granted the degree in absentia on request and payment of the prescribed fees. After the notification of the result, each successful candidate at a non degree examination shall receive a certificate of passing the examination in the prescribed form signed by the Controller of Examinations and the Vice Chancellor on payment of prescribed fee. The Controller of Examinations shall issue degree/diploma/provisional certificate and final transcripts (detailed marks certificates) on prescribed forms to the successful candidates, on request and payment of prescribed fee and on production of proof of his University clearance and identity.